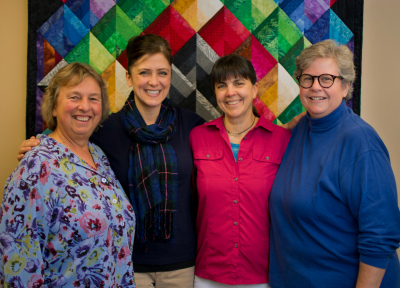 Early in 2000, five like-minded individuals—coworkers at the time—made a decision to create an independent physical therapy clinic in Concord, New Hampshire to reflect common values and healthcare philosophy. Recognizing that patient care necessitates an active and compassionate partnership between patient and practitioner, as well as collaboration with the patient’s other healthcare providers, together we conceived of Foothills Physical Therapy. By the fall of 2000, we had transformed a dirt-floored, brick-walled space in the historic Page Belting building on Concord’s Horseshoe Pond into a spacious and inviting clinic, featuring private consultation rooms, a large gym area and state of the art equipment. Most importantly, we created a comfortable, friendly, professional space, filled with positive energy, where working together toward your health goals is an easy and personal process. Our community has grown stronger and stronger since we opened our doors, and we’re proud to continue bringing independent, innovative physical therapy to the people of greater Concord today. Our work is hands-on, and our approach is one of problem-solving and inquiry, always reaching a little further to find the solution. We rely on each other as practitioners for collaboration, regular in-service training and internal rounds, so our patients benefit from the knowledge of the whole team. At Foothills, each patient is under the direct care of his or her physical therapist at all times—we do not utilize assistants to do one-on-one patient care of any kind! Every moment we spend with you is in service of your health goals. And your care will be with a single physical therapist from start to finish, unless you request a change. Foothills Physical Therapy is an active organizational member of Allied Physical Therapy Practices of New Hampshire, an organization that promotes therapist-owned physical therapy practices and patient choice. We are committed to ensuring your right to choose where and with whom you would like to access physical therapy treatment. Today, in 2014, Foothills Physical Therapy remains an an independent practice committed to offering high quality, individualized and patient-centered care. Our goal is the prevention and successful treatment of our patient’s physical limitations and the promotion of their self-care skills for optimal health and wellness throughout life. We’re proud to have been voted the “Best Physical Therapists” in the Concord area six years in a row, from 2011 to 2016, for the Capital Area People’s Preference Awards! Thank you for being an important part of the Foothills Physical Therapy community. We look forward to partnering with you toward achieving your health goals.